American merchant; born at Schenectady, N. Y., March 18, 1858. In 1877 he started a business at Passaic, N. J., and later entered the wholesale clothing firm of his father, David Marks & Sons. He has held many prominent positions in connection with the clothing trade, being president of the Clothiers' Association of New York, president of the National Association of Clothiers, president of the Clothing Trade Association of New York, and chairman of the Hospital Saturday and Sunday Association Trade Auxiliary. He has served also as trustee of the Hospital Saturday and Sunday Association, director of the Educational Alliance, member of the Conciliation Committee of the National Civic Federation, director of the National Butchers' and Drovers' Bank, and is now (1904) organizing credit cooperation in several trades, with the view of establishing a central clearing-house for direct trade information. 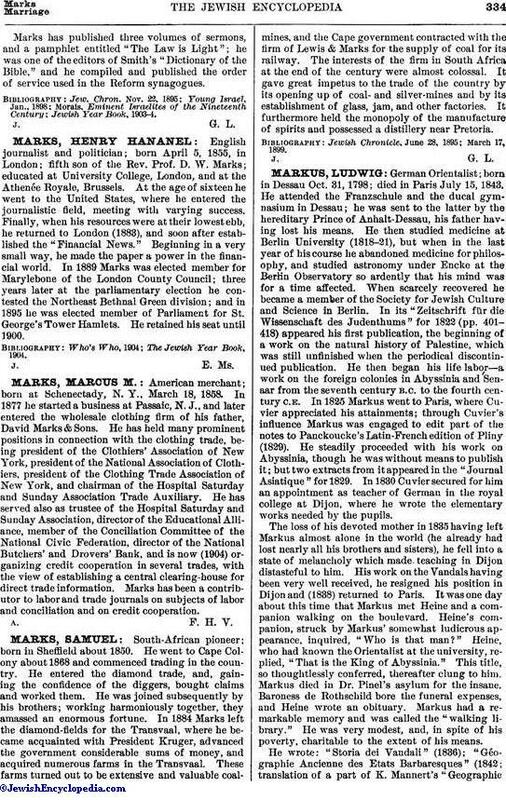 Marks has been a contributor to labor and trade journals on subjects of labor and conciliation and on credit cooperation.